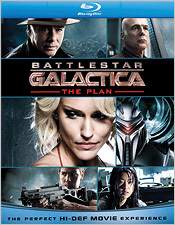 How fun to have just watched the entire Battlestar Galactica series on Blu-ray... and still have a couple more hours to enjoy! Directed by Edward James Olmos, The Plan could also have been called A Tale of Two Cavils. Its moral: You can’t declare war on love. One of the Cavils learns this lesson... and one does not. The film begins a few weeks prior to the attack on the Colonies and ends with the air-locking of the two Cavils as seen in the Season Two episode Lay Down Your Burdens, Part II. Over the course of its 112 minutes, you essentially see a series of vignettes that reveal the events of the Miniseries and the show’s first two seasons from the Cylon perspective... rendering some events and characters in a fascinating new light. In terms of the characters, several benefit from the revelations herein, including obviously Brother Cavil, as well as Boomer and Leoben. But for me, the most interesting was actually a surprise – Simon becomes a much more developed character by the time The Plan has unfolded fully. I should note that it would be hard to watch this as a stand-alone film, because it feels a little choppy as its own narrative. Think of it as gap-filler for the show’s first two seasons. But it becomes more involving as it goes and by the time it ends, it’s really built to a fascinating, rewarding – and I would say even a bit shocking - conclusion. The video and audio quality on Universal’s Blu-ray is every bit as good as that of the regular series Blu-rays. Image detail is fantastic, the style is typically gritty, and color and contrast are both excellent. The DTS-HD audio is dynamic and the perfect match to the visuals. There were actually a couple times when the rear channel play made my head turn – in a good way. I have no A/V complaints whatsoever. The special features package is surprisingly good too. No, the Face of the Enemy webisodes are not here, and that’s bummer. But what you do get is well worth having. Obviously, there’s a full-length commentary with Olmos and writer Jane Espenson. I’ve only had time to sample it so far, but what I’ve heard is fascinating – I’ll definitely be giving the full track a listen soon. There are four featurettes, all in HD, totaling about 37 minutes. From Admiral to Director follows Olmos behind-the-scenes, The Cylons of the Plan talks about the specific Cylon characters, and The Cylon Attack examines the staging of a specific action scene. As for the fourth featurette... you remember how I was always complaining in my reviews of the individual season DVDs that we never got a featurette on the show’s special effects work? Well, it seems that someone was listening, because Visual Effects: The Magic Behind The Plan is just what “Digi-Bits” Actual ordered and at 19 minutes, it’s the longest piece on the disc. (Thanks guys!) Rounding things out, you also get 13 minutes of deleted scenes (in standard def), BD-Live access and D-Box enhancement. But by far the coolest thing on this disc is something I’ve known about for a couple months now, and it’s been killing me not to talk about it. You see, our old friend Mojo (who as you may know was on the show’s VFX team) came up with the idea for an Easter egg on this disc, and it’s one of the best Easter eggs I’ve seen in a long, long time. Not only is it the very last visual effects shot rendered for Battlestar Galactica ever (in full HD) and a fitting coda for the series... it’s also an incredibly cool tribute to the original 1970s show. I’ll say no more. Just rest assured, the geek factor is high, it’s easy to find... and you’ll be very glad you did. Thumbs up, Mojo! Having just seen Battlestar from start to finish on Blu-ray, I can tell you first-hand how well The Plan ducks and weaves its way through the series’ overall narrative. I suspect that a lot of people who haven’t yet gone back to revisit the show are going to be inspired to do so after watching this. And with the Blu-rays now available, hell... why wouldn’t you? Trust me, you’ll have a great time with it. For me at least, Battlestar Galactica is the gift that keeps on giving. And there’s nothing like finding one last cool surprise at the bottom of your Christmas stocking. If you’ve never seen Battlestar before, you definitely don’t want to start here. But if you love this show, and you’ve already seen it all... The Plan is absolutely required viewing. Enjoy!